County of Norfolk: Attleburgh [Attleborough] (3), Besthorpe, Breckles, Carbrooke (2), Caston, Great Ellingham (2), Little Ellingham, Griston, Hargham, Hockham, Illington, Larling, Merton, Ovington, Rockland All Saints, Rockland St Andrew, Rockland St Peter, Roudham, Scoulton, Shropham, Snetterton, Stow Bedon, Thompson, Tottington, Watton (2). Later Additions (all from 1902): Banham, Eccles, Kenninghall, New Buckenham, Old Buckenham, Quidenham, Wilby. The population falling within the Union at the 1831 census had been 10,643 with parishes ranging in size from Roudham (population 73) to Attleborough (1,939). The average annual poor-rate expenditure for the period 1833-35 had been £9,450 or 17s.9d. per head of the population. A new Wayland Union workhouse was erected in 1836-7 at Rockland All Saints. The Poor Law Commissioners authorised an expenditure of £4,128 on construction of the building which was intended to accommodate up to 250 inmates. The site location and layout are shown on the 1904 OS map below. The building is believed to have been designed by either William Thorold or William Donthorn, both of whom were the architects of other workhouses in Norfolk. The design of Wayland appears to be based on Sampson Kempthorne's model cruciform plan published by the Poor Law Commissioners in 1835. 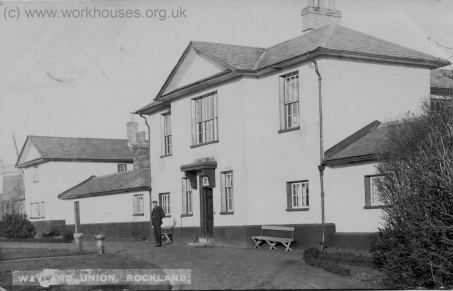 Wayland workhouse from the north-west, c.1905. It had a entrance range at the west which contained the porter's lodge, board-room, offices and so on. Wayland workhouse from the south, 1905. Wayland workhouse from the south (detail), 1905. To the rear, radiating from the central supervisory hub, were four accommodation wings for the various classes of inmate (male/female, old/able-bodied etc.). The areas between the wings were divided in segregated exercise yards. Service and workshop buildings formed the square perimeter of the workhouse. The building was used as the station for the local home guard during the Second World War. Most of the workhouse buildings have been demolished. The central part of the entrance block has now been converted for use as a private house. 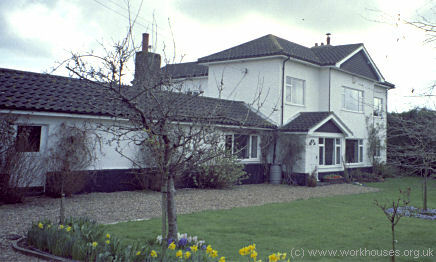 Wayland former workhouse from the north-west, 2000. 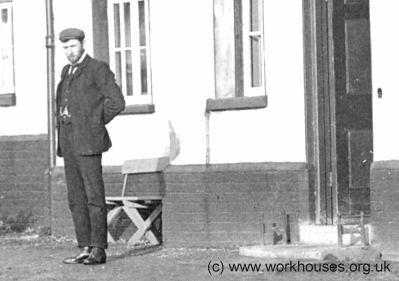 As well as the workhouse, the union established a poor law infirmary which was erected at Attleborough in 1911-12. 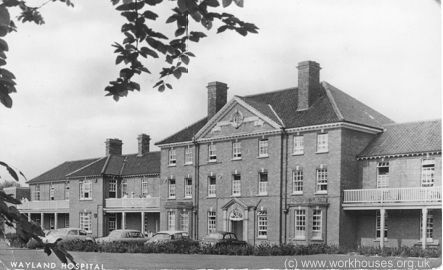 The building is still in use as a local hospital. The Wayland Union established a children's home at New Buckenham. No further detals have been ascertained. Norfolk Record Office, The Archive Centre, Martineau Lane, Norwich NR1 2DQ. Few records survive — holdings include: Guardians' minute books (1835-1900, 1905-8, 1912-30); Births (1837-1914); Creed register (1914-39); etc.